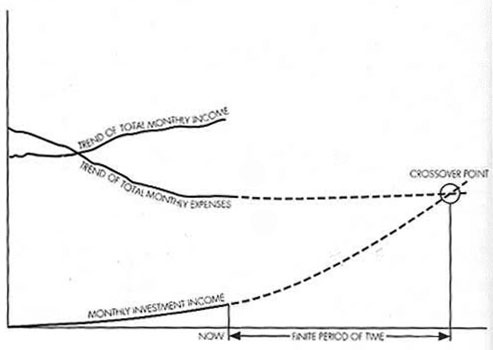 Today, I want to propose that what money people are searching for is something that the excellent book Your Money or Your Life calls the “crossover point.” Simply stated, the crossover point is that point at which your investment income exceeds your expenses. 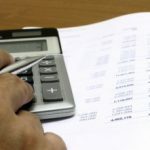 Once you reach the mythical point where your investment income finally exceeds your expenses, you will have effectively achieved financial independence. By saving more and spending less, you’ll accelerate your approach to this magical benchmark. First up, let’s consider a hypothetical 25 year old with an annual income of $60k, a 15% savings rate (i.e., spending = 85% of income), an annual raise of 3%, annual inflation of 3%, an annual investment return of 6%, and a current portfolio of $10k. As you can see, our hypothetical investor won’t actually reach the crossover point before the traditional retirement age of 65 rolls around. But what if they ratchet up those savings to 25%? As you can see, this strategy accelerates things significantly – our hypothetical investor now reaches their crossover point (where the blue and red lines intersect) by their mid-50s. 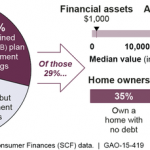 Obviously, the math underlying these scenarios is a major oversimplification (most notably that returns are included as a constant), and there are some questionable assumptions – e.g., that your spending will increase as a constant percentage of your income. Nonetheless, it’s still instructive to play with the numbers. It’s also worth nothing that you can have a comfortable retirement even if you never hit the crossover point. By getting to a point where your portfolio can more than provide for your needs without touching the principal, you’ll have income in perpetuity – but you won’t live forever. So, dear readers, how do things look for you? Are you on the path to financial independence? If so, when do you expect to get there? If not, what (if anything) are you doing to get yourself on track? The link only works for investments in stocks/bonds, not real estate but other than that, I think it is great. At this point my real estate in producing more income than my stock/bonds but I would love to have it so either was causing me to be at my crossover point. I think I have quite a few years to go before I get there, but I think I have a good start with almost $10000 in investments and a duplex that provides $525/month in rent. 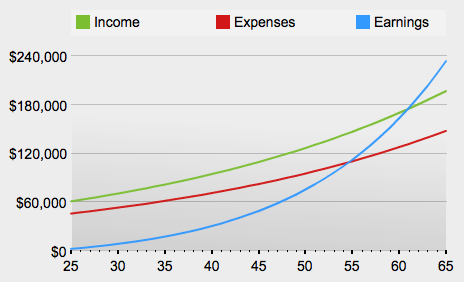 A few years ago I reached the point where Schedule B covers living expenses, but I’ve never taken this to mean financial independence because I know that unlike wage income which tends to be “sticky”, financial market returns most assuredly are not. 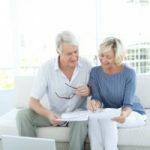 The past few years shows us that the extra buffer you need to achieve financial security is huge. This is why most people we would regard as wealthy do not feel secure– most of their assets are paper and they know what can happen to these. I’m still young and a long way off from retiring…but I realize that it’s never too early to start investing. It seems that sometimes it’s just all so confusing people decide to do nothing, and then suddenly it’s too late. Thanks for motivating me. This is pretty awesome. I bookmarked that site, great motivation for keeping up with the investments. @Steve Ummm. 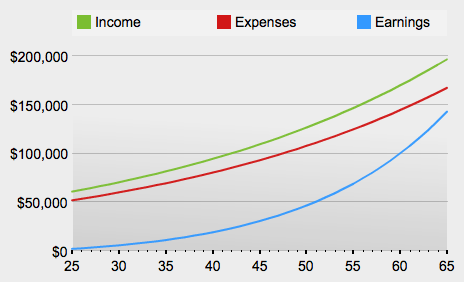 If the income that you’re making solely based on investments is > expenses… Why not retire? Unless you love what you do. Evan, it is supposed to. If a company pays a dividend after market closing (say at 6pm), the opening share price, futures markets, and indexes are all adjusted to make it a “wash”. If the stock then goes up, well that’s just gravy — however the dividend itself shouldn’t have any affect at all (like Nickle describes). Now, the reasons why (in the real world) that a company’s share price would go up after a dividend payout (especially if it _increases_ it’s normal dividend) is because investors see that as confidence in the management to continue to deliver strong returns — people jump on that. Dividends also ward of bear-investors, who love to short stock, so a big dividend will squeeze the shorts (so they have to _buy_ to cover their shorts — their buying will inevitable raise the price). According to the calculator I should retire today. I think I might wait a couple decades yet. I think dividend investing offers you the option of using cash (the dividend pay out) OR selling shares. From what I have read, it just doesn’t seem to work that way. Every time a dividend is paid out, the company (in the real world, not on paper) doesn’t go down exactly by that amount, and more often than not it trades back at the same rate within a few days. Evan: If your portfolio grows (say) 6%, it doesn’t matter if it’s b/c of capital gains or dividends. You still have 6% more money than you used to. You either spend the dividends or sell a few shares. The net effect is the same. Consider two $1M portfolios. For the first, the price appreciates 5% to give you a total value of $1.05M with no dividends. In contrast, the second pays out 5% dividends, so now you have $1M + 0.05M = $1.05M. The total return is identical, they just differ in how you access the gains (one requires selling shares, the other is already in cash). And yes, I realize that I’m oversimplifying. I’m just trying to illustrate that it doesn’t matter how you achieve the gain in value. I would also argue that it’s invalid to assume that a stock paying (say) 5% dividends will appreciate the exact same amount as one with no dividend. In the former case, you are effectively taking money out of the business. In the latter case, the business is reinvesting those profits to spur future growth. What I never understood about those calculations is that assets growing at 6% or 8% aren’t throwing off the same of income. FCN, I think this brings it back to our discussions about dividend investing. To actually yield that 2 to 5% and then still have growth. I played with the tool you linked “What’s My Crossover”. Just changing the assumed inflation by 1% has massive repercussions — it doesn’t instill much confidence for me to ever reach the cross-over point.